ASU students and recent graduates involved in Camp H.O.P.E are (front row, left to right) biology major Rini Parekh, nonprofit organization management majors Melissa Stein and Lindsay Mullins, biomedical engineering graduate Tina Hakimi, art major Natalie Saez, (middle row, left to right) biomedical engineering major Neil Saez, biochemistry major Monica Varela, and psychology major Nancy Valtierra (top row, left to right) business major Nicholas Johnson and biochemistry major Ryan Baker. A team of Arizona State University graduates and students will spend a part of the summer working to expand a nonprofit venture to bring a message about higher education to orphans and foster children. Camp H.O.P.E. (Helping Orphans Prosper through Education) was started a year ago by Tina Hakimi and Neil Saez. Hakimi recently graduated with a degree in biomedical engineering. Saez is a senior in the same program in the School of Biological and Health Systems Engineering, one of the ASU’s Ira A. Fulton Schools of Engineering. Looking to undertake a community service effort that would aid children, Hakimi contacted Saez in 2011 after learning that his father, Carlos Saez, was the founder of Friends of the Orphanages. The 25-year-old nonprofit provides funds, food and clothing for children at orphanages throughout Mexico. Through Saez’s connection with Friends of the Orphanages, he and Hakimi were able to connect with orphanages in Mexico. 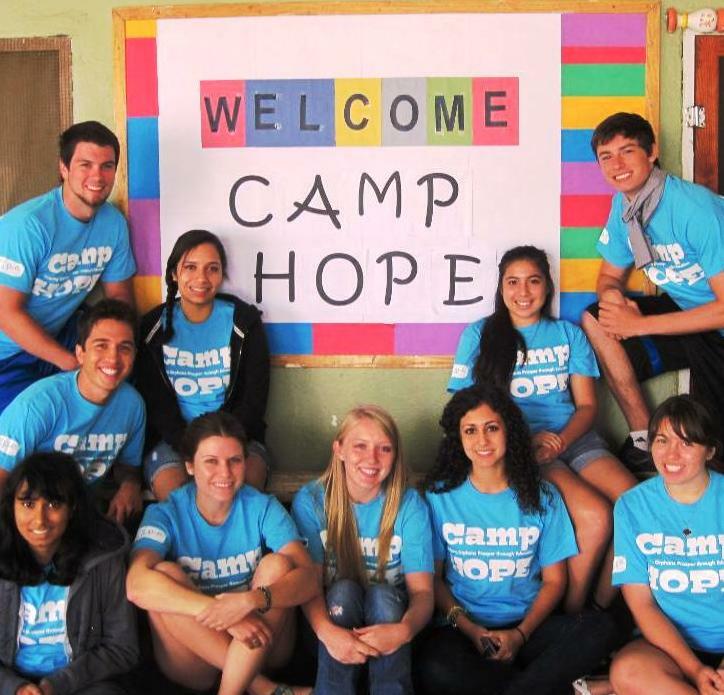 By last summer they had recruited eight other ASU students to help them with Camp H.O.P.E.’s first project, putting on a camp for more than 100 children in an orphanage in Ensenada, Mexico. The five-day camp focused each day on showcasing a different academic discipline or career field. The Camp H.O.P.E. founders want to provide mentorship to disadvantaged youngsters “who may need the guidance of motivated college students to aspire to a career,” Hakimi says. “Even though many of these children do go to school, the kind of education they are getting is not stimulating and it’s not encouraging them to think it could be fun or fulfilling to be a bioengineer, a political scientist or a journalist,” she says. In Mexico last summer, Camp H.O.P.E. leaders got the children involved in educational activities such as “Project: Estado 29.” The youngsters examined orphanage buildings and identified things that posed problems, had been broken, or needed to function more effectively. Then the children worked with the camp counselors to devise solutions. The Camp H.O.P.E. counselors have continued to communicate with the children in Mexico. “It’s been cool to keep in touch with them. We have made some YouTube videos for them and have written letters to them,” as ways to continue mentoring the children, Saez says. The team plans to organize camps for orphans and foster children in Arizona this summer. The members raised money for camp supplies and food this spring by organizing and hosting an auction and dinner. “Tina and Neil are applying good engineering design principles” in devising camp activities, says ASU biomedical engineering assistant research professor Jeffrey La Belle, who is the faculty adviser to Camp H.O.P.E. “With the critical situation we’re facing with K-12 funding support, it’s wonderful to see students taking a lead in figuring out a unique solution and being successful in implementing it,” La Belle says. For more information, visit the Camp H.O.P.E. website.